Pop. 750, El. 2457 ft.
We offer clean spacious rooms, free newspaper in lobby, free continental breakfast, business center with computer, luggage storage space, guest laundry facility, and Wi-Fi throughout the hotel. 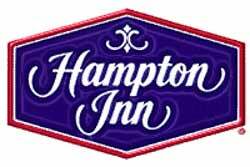 All guest rooms include hairdryers, coffeemakers, cable TV, and HBO.  Deluxe Continental Breakfast  Indoor Pool & Spa  Business Center  Fitness Center  Whirlpool Suites  Microwave & Refrigerator in Every Room  Beautiful new property, ample bus parking, 75 guest rooms. 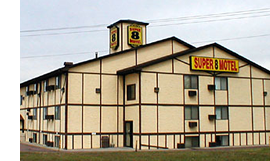 Independently owned and operated motel located in beautiful Mitchell, SD. We are dedicated to hospitality and service at an incredible value. 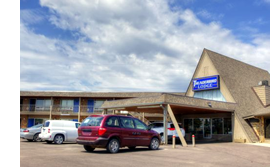 Whether you are staying for business or pleasure, our friendly professional staff assures you the most satisfying stay possible, as we welcome you to the heart of South Dakota. Welcome to the Kelly Inn! 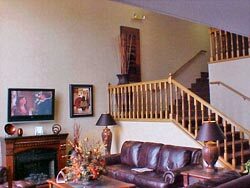 Your ideal choice for Mitchell South Dakota hotels. 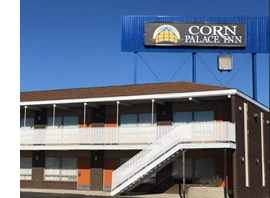 The Kelly Inn Mitchell provides lodging in Mitchell near the Corn Palace. The Kelly Inn Mitchell is a beautiful 3-story hotel with a log and rock exterior offering a unique blend of atmosphere and hospitality with the northwood's motif in the lobby and guest rooms.